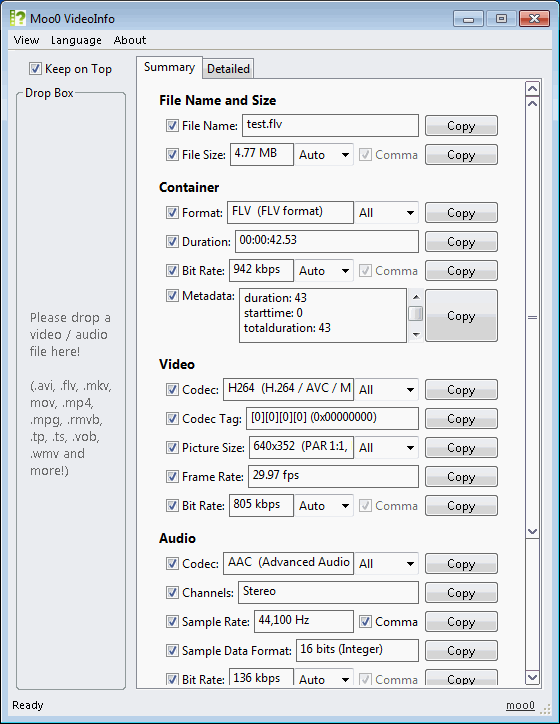 Moo0 Video Info is a very easy tool which can dispaly each video / audio file's information. Have you ever wondered why the video file doesn't play on your machine?, what codecs it uses?, or what picture size it's actually in? Then, this tool may be one of the easiest tools which you can use to find them out. Ondersteuning voor Chinees (Vereenvoudigd) is mogelijk gemaakt door Zhang Zhe. Onze welgemeende dank!! Ondersteuning voor Polish is mogelijk gemaakt door Zbigniew Strzelczyk. Onze welgemeende dank!! - Added Greek languages support. - Minor bug fixes for the last version. - Updated the core video analysis engine. - Its English name has changed from "Moo0 VideoInfo" to "Moo0 Video Info".